In the movie Office Space, when questioned about his professional duties, the character Tom Smykowski famously said that he deals with the customers so the engineers don’t have to. “I have people skills; I am good at dealing with people!” Although this conversation was intended to be funny in the movie, the role of the business analyst is similar. The question, “What does a business analyst do?” is often asked, largely because business analysts wear many hats. There are several answers – business analysts serve as problem solvers, communication conduits, strategic planners and process designers. And yes, successful business analysts are also good at dealing with people. Although a great business analyst (BA) can enhance a project in a multitude of ways, there are three key areas where the presence of a great BA can significantly improve the overall outcome and success of the project. Can you see the forest through the trees? A good BA not only understands the finer points of a project but also understands how all of the little pieces fit together to form the “big picture.” Not only does the BA need to analyze all of the requests for how the system is supposed to perform, but the BA also needs to be able to read between the lines and understand the larger goals and outcomes of the project. By having both the 30,000-foot view and the 10-foot view, the BA can improve the project by providing a level of analysis to bridge the gap between the requirements, scope, timeline and overall project goals. Consider this example of a portal development project. The 30,000-foot view is that the project’s goal is to develop a portal that allows external companies to view order status information, request product quotes, and manage their account information. On the other hand, the 10-foot view is that the portal needs to support the display of order status information for the past two years and the information needs to be presented in a sortable table with different column headings depending on which external company is viewing the information. The BA can help improve this type of project by providing not only an understanding of the 30,000-foot and 10-foot views, but also by filling in all of the airspaces with a deep understanding of how to get from high level to the supreme details. For instance, the BA can help understand the needs and wants of each of the external companies using the portal to ensure that when going from 30,000-feet to 10-feet, nothing gets missed. A BA will provide a level of analysis that takes into account many aspects of the project likely to be otherwise overlooked. In a nutshell, the BA will be able to help better analyze the goals, needs and wants of each request from across the company to help construct a solution that provides the optimal outcome for all parties. Often times, a BA can find themselves stuck in the middle of a large game of telephone, trying to interpret messages from a variety of different constituents. With projects typically involving an assortment of people from the company and each group having a unique perspective on the goals and outcome of the project, it is important that the BA have strong communication skills in order to facilitate discussions across the groups. Consider a project where a manufacturer of high-performance appliances for personal and business use is developing a new e-commerce website. The digital marketing team wants to provide their online customers with order tracking information, including integration with the respective shipping provider. This would allow customers to get real-time updates on the status of their orders. However, the fulfillment team, although they may agree that this is a good function to provide to customers, indicate that, within the scope of this project, this functionality cannot be provided due to limitations of their back-office operations. Although one would imagine that the digital marketing team and the fulfillment team could discuss these limitations on their own, it is often times the BA on the project that needs to facilitate those discussions. A BA with strong communication skills can efficiently communicate with each group and help everyone understand both limitations and needs. Additionally, a great BA takes that dialogue a step farther by working with both groups to see if there are other alternatives that can be leveraged to meet the desires of both groups as much as possible. A great BA is a person who can come into any situation and make sense of the chaos. BAs can meet with the marketing team, the customer service representatives, the developers, the CIO, etc. and understand their particular points of view. After these meetings, a strong BA can successfully provide a synopsis of everyone’s wants and needs and take a seemingly disparate set of requests and make them into a cohesive story. Presentation skills are not always seen as being mission critical in the BA toolkit, but for a project to be truly successful, a great BA needs to have well-developed presentation skills. Even if a BA can create thorough and comprehensive requirements documentation, the quality of that work can be lost if the BA cannot clearly present the results of their research. The work of a BA can only be a true success when all project stakeholders completely understand the project findings and are clear on next steps. 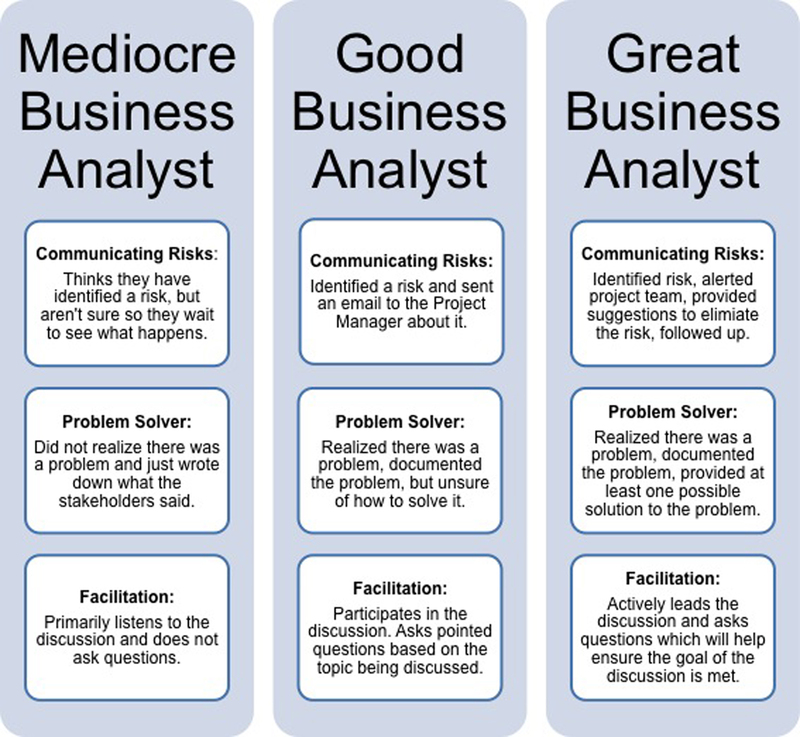 The chart below further demonstrates the differences between mediocre, good, and great business analysts in regards to real-life scenarios. Along with the above examples, you can see how having a great BA can truly improve the overall success of a project. When Tom Smykowski in Office Space was asked about his work, he should have talked not only about his people skills, but all the other skills he brings to the table during a project. A great BA is a combination of not only analytical, communication, and presentation skills, but so much more. Think back to the last successful project you worked on and likely there was a great BA there to help get it over the finish line.